It is with great sadness that the family of Margaret (Mickey) Jaffray announces her passing on Wednesday, July 5 in Kamloops, BC at the age of 87 years. Margaret was predeceased by her parents John and Isabel Van Schadewijk and her sisters Mary, Helena, Isabel, Rachel (Ricky), Antonia (Ann) and Florence (Lala). Her spirit is carried on by her children George (Ursula), Greg (Marilyn), Teresa (Dan) and Laura (Chris) and her many grandchildren, great-grandchildren, nephews and nieces. Margaret always had a special place in her heart for Bob Napier, sister Florence’s husband, who had the enviable task of caring for all of the sisters. He performed this task with integrity, extending great care and love to the Van Schadewijk girls. Thank you Uncle Bob for all that you do for the family. Mom was always active in her community. 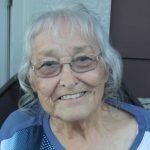 Along with her sisters and children she spent many years shepherding UNN Local 112 ensuring that urban Aboriginal people had the services they required for a healthy and productive life in the city. She used this experience to form the PG Metis Elders Society, which was a source of great joy and pride for her. She loved this work, the people she worked with, the community she belonged to and above all the Elders, who she understood were the keepers of the culture. She will be greatly missed by all that knew her. A Celebration of Life will be held for Margaret on Saturday, July 15, 2017 at the Prince George Native Friendship Centre from 3:00-6:00pm, refreshments to follow.